The DareDevil was designed to answer the needs of professional users in terms of speed, ease of use and hole quality. A first for spade bits, the full cone threaded tip provides the speed needed to drill faster and it pulls the bit through the material with less effort and vibration than other spade bits. This set includes: 3/8-inch x 6-inch Spade, 1/2-inch x 6-inch Spade, 5/8-inch x 6-inch Spade with Spur, 3/4-inch x 6-inch Spade with Spur and Reamer, 7/8-inch x 6-inch Spade with Spur and Reamer, and 1-inch x 6-inch Spade with Spur and Reamer. The DeWalt IMPACT READY Bit Set with Flex Torq Compact Tough Case (31-Piece) is ideal for any applications where impact drivers are used. This set includes most common accessories for the mechanical trade. The Tough Case comes with an adjustable belt clip for easy transportation. 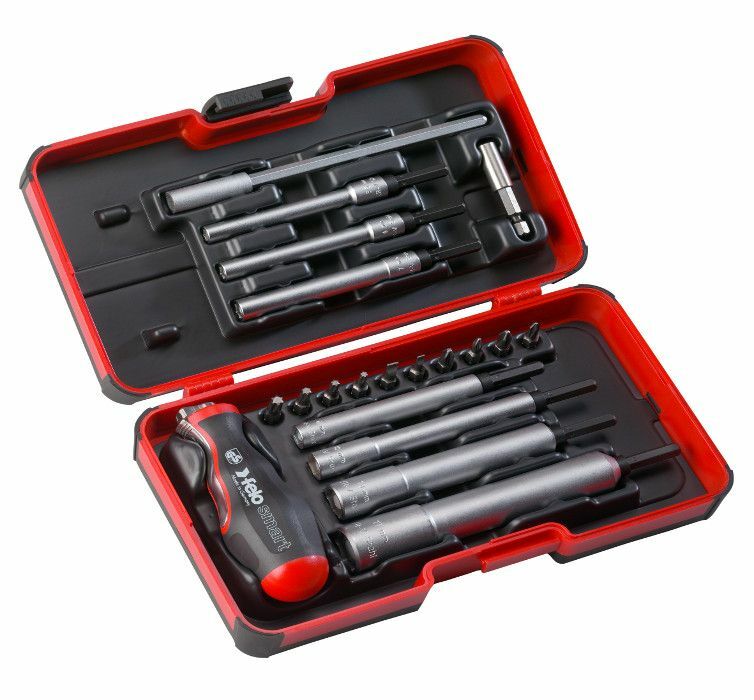 21-Piece Engineer Set, M-Tec Nut Driver, and 2-in-1 Screwdriver and T-Handle in StrongBox Felo-SMART Engineer Set M-Tec combines the Spring Loaded Nut Driver and the screwdriver and T-handle in one. The magnet body is retractable to allow the nutdriver to take long threaded bolts. A spring-loaded magnet corpus holds the screw or nut and places it also at points which are hard to reach. 20 Pcs in StrongBox. One-hand operation: It's no longer necessary to replug the blade in order to switch between screwdriver and T- handle use. All pieces in 1/4-inch suitable for Cordless Screwdrivers. 2 component handle with soft grip material for highest torque. Blades made from high-quality steels. Anti-roll handle design.